Walt Disney Presents Silly Symphonies: The Sunday Newspaper Comics Volume One 1932 to 1935 [IDW; $49.99] was about as far away from an impulse buy for me as it could have been. 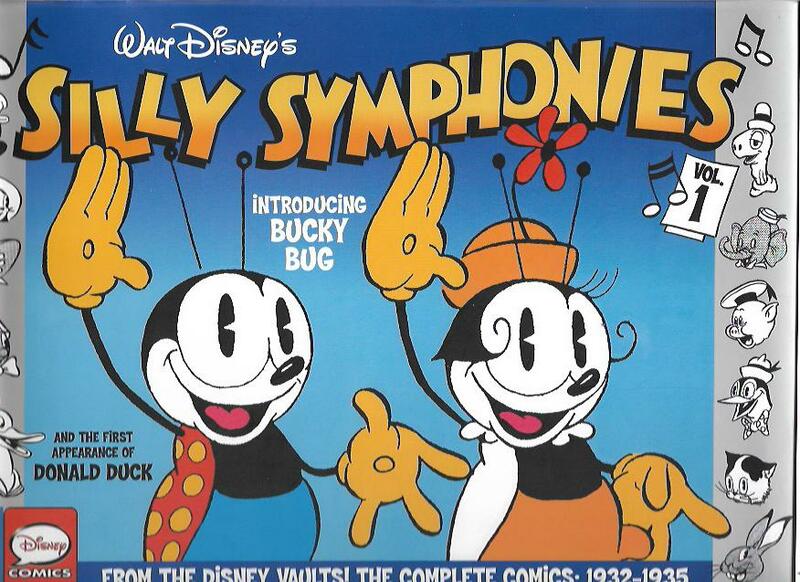 The “star” of this first volume is Bucky Bug, a character whose appearances in comic books always left me cold. You see, the Bucky Bug stories were always in rhyme with poetry so bad it was almost a crime. What changed my mind? The cover appealed to me. The visual designs of Bucky and girlfriend June Bug are welcoming. Dean Mullaney, the editor and co-designer of The Library of American Comics, creates beautiful books that are handsomely made and packed with comics and informative essays. Written by Earl Duvall, Ted Osborne and Merrill DeMaris, the Bucky Bug comic strips are exciting adventures, a coming-of-age tale of a plucky young bug discovering and making his way in a vast world. Bucky goes a’wandering, starts a business, meets a girl, leads an army to victory, reconnects with his parents and takes the reader to a satisfying conclusion of his story. The rhyming in these comic strips is much better than that in the comic books. I found myself reading the strip out loud, albeit only when no one was around but my cat Simba. She seemed to enjoy this, but, you know, cats. Who can tell for sure? Drawn by the deservedly legendary Al Taliaferro, the comic strips were loosely based on the Silly Symphonies cartoons. Following the Bucky Bug tales, we get six more stories, including the comic-strip debut of Donald Duck. From the impulsive youngster of “Birds of a Feather” to the shark-fighting hero of “Penguin Isle” and the very trippy “Cookieland,” these are fun comics. I love this volume and, when I buy the second volume, it won’t be an impulse buy. I know a treasure when I see it. Silly Symphonies Volume One is my pick of the week. Shigeru Mizuki’s Kitaro has become one of my favorite characters in comics, manga or otherwise. The one-eyed lad – yes, it looks like he has two eyes, but the bulging eye is actually the spirit of his father – is the last member of the Ghost Tribe of yokai or spirit-monsters. He has inherited all the powers of the Tribe, using them to assist humans and others who have been attacked or victimized by evil yokai. 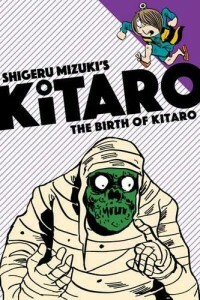 The Birth of Kitaro [Drawn and Quarterly; $12.95] recounts the tale of Kitaro’s birth and presents six other stories of the courageous boy’s battles with evil yokai. Featured in several stories is his sometimes friend and sometimes foe Nezumi Otoko, whose schemes to attain worldly wealth always backfire on him. Kitaro is a popular figure in Japanese folklore whose origins seem to predate Mizuki’s manga. But the Mizuki version of the character, which he wrote and drew for fifty years, is easily the most beloved of them all. The Mizuki adventures are lighthearted, but they have an excitement and sense of wonder to them that would appeal to fans of the traditional super-hero comics of the 1960s if they gave them a chance. Kitaro is one of a very small handful of manga characters I’d like to write. In addition to the manga stories, The Birth of Kitaro also includes an informative piece on the history of Kitaro by Zack Davisson, a “Yokei Files” piece by Davisson and eight pages of puzzles to test the reader’s yokei knowledge. Amazon lists the age range for The Birth of Kitaro as 12-15, but I think it can be enjoyed by younger and older readers as well. If I had reviewed it before Christmas, I would have recommended it as a cool stocking stuffer, but the book would be a swell gift for any occasion. Check it out. I became a Marvel kid in the 1960s and mostly stayed that way for the next few decades, even when I was writing for DC and some other publishers. These days, the two companies often change places in my estimation. Right now, courtesy of DC’s “Rebirth” whatever it is – “reboot” doesn’t seem to cover it – I’m enjoying more DCU titles. But I still enjoy a great many Marvel titles as well. If Marvel has fallen to second place in my ranking of the Big Two, it’s because the company’s “big event” storylines are nihilistic and damaging to characters I loved. Captain America is turned into a virtual Nazi. Other characters are slaughtered for shock value. Relationships are broken. Unconquerable Wakanda gets conquered on three separate occasions. I find reading these stories unpleasant, even when they contain the germ of a good concept. Case in point: the Inhumans/X-Men War. Even though it was clearly driven by a executive hissy-fit over cinema rights, the notion of Marvel’s two races of super-powered beings at odds with one another is intriguing. I sat down to read the recent Death of X #1-4 mini-series, wherein the agendas of the Inhumans and the mutants clash to deadly effect. The Inhumans hold the Terrigen Clouds, the gaseous substance that triggers change in latent Inhumans, sacred. Those same clouds have been proven deadly to mutants. Written by Jeff Lemire and Charles Soule with pencil art by Aaron Kuder and Javier Garron, Death of X has the Inhumans determined to defend the Terrigen Clouds while trying to assist some of the X-Men in finding a cure for its deadly effect on mutants. 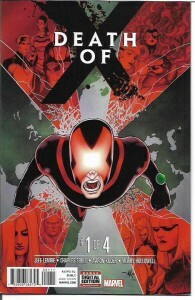 Other mutants, notable a faction led by Cyclops and Emma Frost, are determined to destroy the clouds forever. The Cyclops of the current Marvel Universe is a stranger to me. I haven’t enjoyed the paths he has taken. But he’s not wrong in his desire to protect his fellow mutants by destroying the Clouds. Nor are Medusa and the Inhumans wrong in wanting to preserve the only means of adding to their numbers. That nuanced conflict made this series work for me. Enough so that I’ll be checking out subsequent comics in this ongoing event. The four issues of Death of X should be available from your local comics shop or online. A trade paperback collection [$17.99] will be published in March. Worth checking out. This is the last “Tony’s Tips” of 2016. I want to wish my readers a happy new year, even though I realize that year is terrifying for readers who, by virtue of their gender, race, religion, sexuality, nationality and progressive beliefs were demonized and threatened by the President-Elect and his followers. The only consolation that I can offer these readers is that many of us, perhaps the majority of us, stand with you. We’ll be there for you for the simple reason that we are all stronger together. Always forward…to 2017 and beyond.